This postcard shows a view of the stone pavilion and monument at Pawnee Rock in Barton County, Kansas. The site, located in the southwest corner of Barton County, is about 100 yards from the old Santa Fe trail. It is considered sacred ground for the Pawnee Indians who held tribal councils on its flat top. For pioneers passing through the area, the landmark was considered a half way point of their journey and many would engrave their names into the stone. 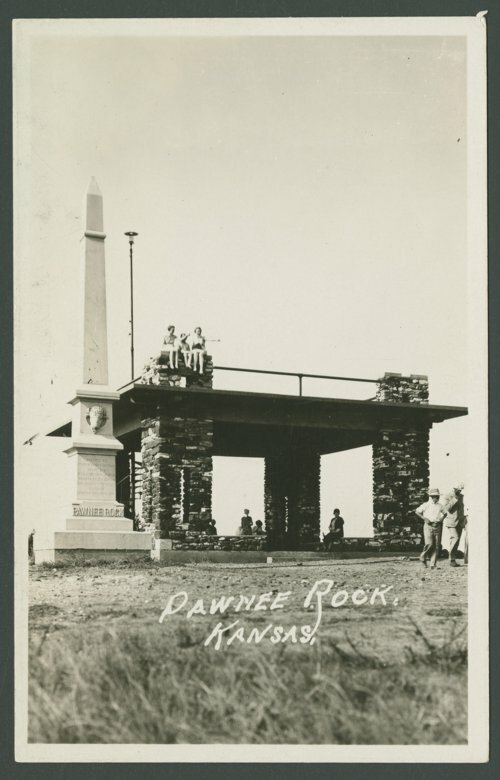 In 1909 through the efforts of the Woman's Kansas Day Club, the remaining portion of Pawnee Rock became a historic site. On May 24, 1912 the stone monument was dedicated before a crowd of some eight thousand onlookers. The site was listed on the National Register of Historic Places in 1970.